Need Dental Crowns But Don't Have Dental Insurance? No Dental Insurance But Need Dental Crowns? Crowns are a great protector of your teeth if damage or decay has been found by your dentist. It’s not something you should ignore when your dentist recommends you get a crown. But with every procedure, understanding its purpose and cost is important, especially if you have no dental insurance. How Much Does it Cost to Get a Dental Crown? Dental crowns, by themselves, cost anywhere from $300 to $1,400 depending on the type of crown you need. Below are some average prices for each type of crown if you have no dental insurance. Disclaimer: For the most up-to-date treatment prices in your area, please visit the 1Dental fee schedule and enter your zip code. There is a lot that goes into the cost of getting a dental crown beyond just the crown. Below are a few more things you might need with your dental crown, which can range between $100 and $450 per crown with no dental insurance. Why Do I Need to Get a Crown? The color, shape or even alignment of the tooth. Stainless Steel: Stainless steel crowns are used as a temporary measure for permanent and primary teeth. They are most commonly used for children’s teeth because their primary teeth will soon come out, making the stainless steel crown fall off naturally. In adults, more trips to the dental office are required to place this type of crown. 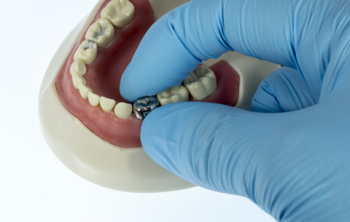 Metals: For metal crowns, less tooth structure needs to be removed in preparation for the crown. These crowns probably last the longest as far as wear and tear. Porcelain-fused-to-metal: These crowns look like normal teeth, which is a plus. However, they can have a lot of wear and tear on the opposing teeth when you bite down and chew and the porcelain part of the crown can break off. Porcelain-fused-to-metal crowns are good for front or back teeth. Ceramic or Porcelain: All-ceramic or all-porcelain crowns are a great choice if you’d like the crown to match the natural color of your teeth. These are also a great option for individuals who are allergic to metal. Keep in mind, like other crowns, these can wear down on opposing teeth more than metal or resin crowns. Resin: All-resin dental crowns are the least expensive compared to the other types of crowns listed. However, like other crowns, they do wear down over time and they can fracture more easily than the porcelain-fuse-to-metal crowns. Temporary vs. permanent: Your dentist will be able to advise you on whether temporary or permanent crowns are your best option. Temporary crowns are usually made in a dentist’s office while permanent crowns are created in a dental laboratory. Disclaimer: The prices listed above reflect what you can expect to pay at a general dentist that accepts our Careington Care 500 plan, not at a specialist. Specialists in our Careington Care 500 network have agreed to a flat 20% off their prices, which may vary depending on the specialist you see. As you can see, purchasing crowns without dental insurance can be difficult to do. Its high cost is probably not something you budgeted for, but don’t let the price stop you from getting this needed dental protector. Consider discount dental plans to help you save significantly on this dental work. "Took my son to the dentist today, it was only $103 for everything. Before I would have paid over $300!" "I have saved an incredible amount of money...about 50% each visit. For under $10/month it's a bargain!" "I saved over $1,000 with this plan.